Ducklings have hatched this weekend! Here is a photograph of the latest, only 20 minutes ago. There is a beautiful relationship between our ducks. We have an old female and a younger male and female. The younger female, Cirrus had as far as I can tell, laid the eggs and dutifulyl sat on them for most the of the month. However she seemed to lose interest a few days ago and although still acting all defensive and motherlike, she hasn’t been near the eggs but prefers to free range with her man. Trusty old Withwindle though took over and is now foster mum (if not biological mum – hard to tell without seeing the lay) to the ducklings that have hatched over this weekend. Another hatched this morning, but Withwindle had gone wandering. I found her three hatched ducklings wandering amongst the free ranging chickens nearly 10 metres from the safety of the shed and gates. More alarming than the roosters showing an annoyance towards them, our cat Merlin was very aware that 3 snacks were close by. Even as I got the ducklings into the safety of a pen, he went for them and I had to intervene. Cats can’t resist babies. Finally, I managed to get Withwindle into the secure pen with her three ducklings. I went back up into the shed and waited for the other duckling to hatch because the nest is sited in an area open to predators during the day. It is incredibly hard not to intervene whilst watching a tiny lifeform struggling out of its shell, but it’s simply a part of nature that the weak ones won’t get out. One of her other ducklings managed to crack the shell last night, but when I checked this morning it hadn’t made it out. I thought at lot about intervening while I watched this duckling hatching this morning, but I made myself not feel the need to ‘rescue’. 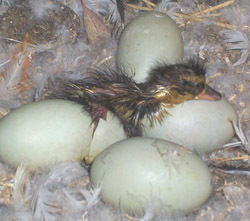 Sure enough, the litlle duckling made it. At this point I had to intervene to get the duckling to Withwindle. She was understandably pissed off at me for kidnapping her baby and communicated that to me with some hefty human bashing. I hope my handling doesn’t make her reject this 4th little one. All the ducks have the same markings as shown above so are a bit hard to name yet, except for one which is bright yellow which I’ve called Tubby because it looks exactly like the floaty bathtub ducks.